This shirt is so easy to wear! Flattering, soft, comfy and looks good with jeans or a skirt. Meant to wear un-tucked, the ends are curved nicely. Dress it up with a long necklace and top it with the fABulous black blazer! Runs true to size – flowly fit. Purple Tri-blend Dolman Shirt set in 1 x 1 tri-blend with baby rib collar with a subtle ABS logo in white. 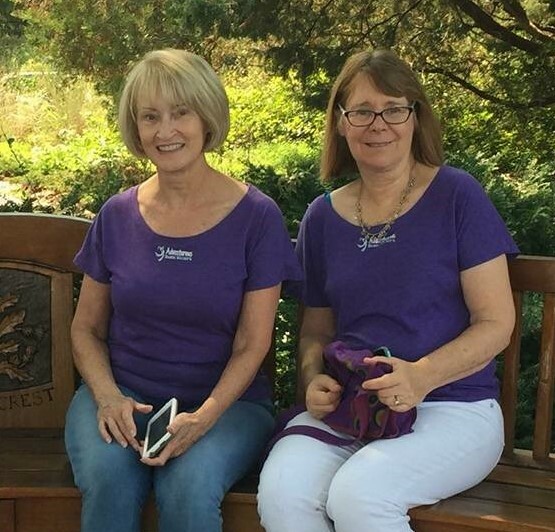 Jerri and Gail taking a break from sight-seeing at the Kansas State Capitol building.